Is there a following for MMD in India? Is MikuMikuDance popular in India? When an Indie uploads an MMD video, does he upload it to YouTube? can it be? Why don’t we get the visits? These days, LearnMMD.com gets almost 15,000 visits a week from around the globe… but only about 65 or 70 visits from India. The United States has a population of nearly 350-million people and LearnMMD gets about 5,000 visits a week from the USA… and I have heard that India has almost 350-million middle-class families! … Why does our web-page get only seventy visits a week? INDIA is online… why not with us? Where can Indies learn about MMD? LearnMMD.com, of course! As MikuMikuDance catches-on in India, I hope the new MMD enthusiasts visit LearnMMD.com to learn from us and to leave comments… and perhaps to write for us, as well. 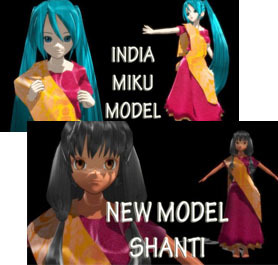 MikuMikuDance in India? … let’s do it! I am from India and recently trying MMD..Lets see…when the people here gets out of facebook. Do keep us posted on your projects. If you have an account on a video sharing website we will be happy to watch. Cheers, from Tamil Nadu, India! Chat us up with your friends… Tell them all about Miku and MMD… YOU could be the start of something BIG! :). I only met a smatter of anime fans here and there, and none irl who have heard of Vocaloid, it drives me mad sometimes. Well, anime and vocaloids are the biggest chunk and the primary source of MMD, but not the only thing that exists there. If you look at deviantArt and search for MMD models, you’ll discover that there are ones depicting characters from many various video games and TV shows, not at all anime related. I’ve seen Doctor Who, Five Nights at Freddie, Star Wars models, etc, not even searching for those. My own passion are models of Portal games’ characters, and I’ve got a *lot* of stuff. Surely you’ll find something that will draw your friends’ interest as well. I just searched Deviant Art for MMD India… and found only 87 results, of which only a few related to Indies and India… but I did find a couple of models attempting to “look” the part. Perhaps these new Indie models performing India’s popular music would put a smile on faces? Maybe we need to set up an inter-school competition, an international competition, to create the best MMD rendition of an Indie classic pop-song… we ask you to pick the song and advertise the competition on LearnMMD… lifting MMD from the sidelines into a competitive focal point… ? For the record, the saris are not badly rendered at all! Shanti is a bit of generic name though, but she may as well fill the part! Damn, I’d love something like that! I am not up to date with movies though ;u;. Thank you for all of your input… ! … Thank you, again. … maybe we can “do” something with Ladio… Here’s a nice, simple video… just voice and guitar… nice!